Anne Waldman’s new investigative hybrid-poem explores the nuances of inter-species communication and compassion. It draws on animal lore, animal encounters (with grey wolf and manatee), dreams, evolutionary biology, neuroscience, and Buddhist ritual to render a text of remarkable sympathy, reciprocity, and power. The poem asks questions as well as urges further engagement with the endangered (including our human selves). Part performance litany, part survival kit, part worried mammalian soundings, Waldman explores, as ever, what it means to inhabit our condition through language and imagination inside a wheel of time. This is the mature work of a philosophical field poet with a shamanic metabolism. This sprawling book-length poem from an American countercultural giant takes its form and concerns from a Tibetan Buddhist ritual and from the poet’s close encounter with the endangered aquatic mammal of her title. This visionary verse and prose attempts to describe the known world of any reach or stretch of imagination/ the relative world of death & change; to praise the resources, but also to limn the limits, of ecological science, of all Western ways of knowing; and to imagine the whole of human and prehuman history, from the humdrum Paleolithic across 20,000 years of ‘keeping’ time once keeping it for all & moving it, time, forward, & it, the art, forward, & it, humanity, forward, & now they want to kill it really they killed it. 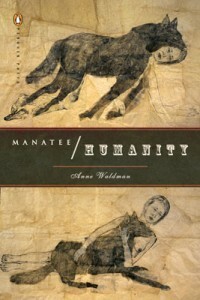 Waldman’s energetic odes and dialogues, part memory and part dream, may learn from the manatee what it is to be human; they also try to understand the nonhuman, from seaweeds and seashells to mammals, asking, [A]re minds possible without language? and answering that they must be. Exuberant as always— though detractors will call her undisciplined—Waldman figures the gap between mind and body as the gap between air and sea, between the manatee’s world and our own. Waldman brings her wild, oracular voice to the environmental questions that currently bedevil us, producing a single long poem in many sections, structured as a Tibetan Buddhist initiation called wang (“empowerment”), in which the enlightenment sought is empathy with other beings. The specific other in this encounter is the endangered sea mammal the manatee, a Pacific herbivore with “more gray matter in the brain than man,” which Waldman sees as a kind of ancestral ocean presence: “the manatee is perhaps thinking archivally deeper than man / ancient days of manatee so many thousands of years . . . mother . . . mother . . . om manatee hum.” Waldman uses both rhetorical and visual devices to demand our attention, but her work is predominantly incantatory, best read aloud: “you know ‘familiars’ / you recognize them by their entanglement / what had been restrained dew-drenched, whir of a loom / our beautiful desire will not pass by.” One of Waldman’s strongest books.